Shake your Rompa at SunGrooves! For us, attention and awareness for our society is important, because of the simple fact that we are not alone in this world. Every step we take (and as Rompa we take lot of global steps) leaves a footprint. Therefore, we see it as our duty to do our bit. On the one hand by taking care of our environment and resources. On the other hand, by treating our employees and surrounding areas with care and attention. We sponsor, for example, a school in the Czech Republic for children who need special education. And in China we sponsor our employees who are part of a team that competes in a dragon boat race (sports is good for body, mind & soul!). And recently we can add a new sponsor activity to our package. One that literally will leave a footprint. Or rather .... footprints. SunGrooves. A small dance festival in Ravenstein, a village near Nijmegen in the Netherlands. "This festival began 10 years ago as a glorified birthday party for ourselves," says Ron van de Water, one of the organizers. "Every year it became a bit bigger and this year, on August 29, we expect over 1300 visitors. And we still do it on a voluntary basis, in addition to our full time jobs. We want to offer the people from this area an evening full of fun; something they look forward to each year. And the great thing is that we can only do this thanks to financial contributions of our sponsors, but also thanks to the commitment of all volunteers. It's really a party in which the community participates" he says proudly. Every year the festival has a theme that has to do with an exotic country. "This year it is Egypt. We carry the theme into the decorations, we all produce by ourselves by the way, and even the food". The enthusiasm of this young organization appealed to us. When we were asked to co-sponsor this year's event, we did nog doubt for a second. And we immediately tackled it in a big way: we sponsor one of the four stages. 'Our' stage we renamed into 'Shake Your Rompa' stage. From afternoon to evening, visitors can listen to DJs such as Robert O, Hipneus & Jim and Novacasa. If that does not put feet in motion?! 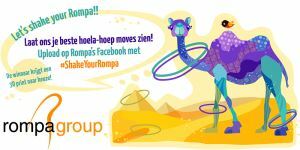 And to emphasize the shake your rompa effect even further, we also sponsor a hula-hoop corner. Here, visitors can show their best and craziest hula-hoop moves. We even have linked a competition to it: show us your best hula-hoop picture (or video) and upload it with #ShakeYourRompa on Rompa’s Facebook-pagina and win a 3D print of an object of your choice. You see, Rompa commits to various types of activities; national and international, regional and local, large and small, educational and sportive, serious and festive ... but always social.